Dietitian Hall Jones developed this recipe with the goal of balancing nutrition and indulgence. 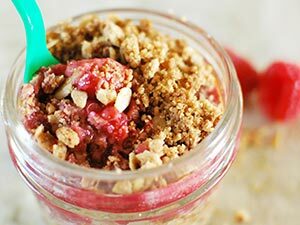 Whole wheat flour, oats and peanut butter give the crumb topping a healthy halo and raspberries in the filling provide a good dose of vitamin C. Baking the crisp in individual jars is an attractive and subtle way to promote portion control. 2. Prepare peanut butter crust and crumble: In medium bowl, combine oats, flour, sugar and salt. Using a pastry cutter, cut in butter until mixture is crumbly. Incorporate the peanut butter until a crumbly consistency forms. 3. Press about 2 heaping tablespoons of mixture firmly on bottoms of six 4-ounce mason jars; set aside. Reserve remaining mixture for topping. 4. Prepare raspberry filling: In bowl, stir together raspberries, cornstarch and salt. Distribute raspberry filling evenly among the jars; top each with a tablespoon of the reserved peanut butter crumble. 5. Set mason jars on baking sheet; bake 18 minutes or until peanut butter crumble is lightly browned and raspberry filling is bubbling. 6. Allow to cool; garnish with peanuts and additional raspberries, if desired. Seal jars with lids until ready to eat.